Though it’s not the beating heart of the city any longer, the Cathedral was where Glasgow originated and spread from and where this walk to the River Clyde starts. The present building dates from the early 13th century and stands over the traditional burial place of St. Kentigern (or Mungo, as he is more popularly known), Patron Saint of Glasgow. Mungo is believed to have established a Christian community on the site in the 6th century. After his death his tomb became a place of pilgrimage where people came to pray for salvation, confess their crimes and seek cures. Their offerings helped to swell church funds and as the town grew in importance the church was enlarged and beautified. From outside, the Cathedral is not overly awesome, yet inside an unexpected narrowness seems to emphasize the height of the ceiling. As the organ resounds and light floods through the stained glass windows, even an atheist’s gaze would be drawn irresistibly heavenwards, up the fluted stone pillars. The Low Kirk underneath, containing the tomb of St. Kentigern, is reached from either side of the main church by stairs that descend into a forest of stone columns supporting a vaulted ceiling. It was believed Kentigern was buried here, although his bones were later moved to a shrine in the main church. St. Kentigern was a popular saint who, it was believed, performed many miracles. Some of these miracles are commemorated in Glasgow’s coat of arms. Look up at one of the lamps lighting the way to the Cathedral to see the salmon and the ring, the resurrected robin, the oak tree (which was the blazing hazel branch of an earlier story) the bell with which he summoned devotees and the little mound from where he preached his sermons. Before leaving Cathedral Precinct, take a turn through the St. Mungo Museum of Religious Life and Art. There’s a wealth of exhibits and information on various religions practiced in the city, including Islam, Hinduism and Buddhism. At the back of the building, with a view towards the Cathedral, the Zen garden is not merely an example of low maintenance garden design but is a place for contemplation. Large lumps of carefully selected rock stand on grass and in a bed of raked white stone chips. From the front door of the Museum of Religious Life and Art, cross Castle Street with care and step inside Provand’s Lordship. This is the oldest house in Glasgow and is a very rare example of 15th century Scottish domestic architecture. Furniture and fittings recollect the interior as it might have been around 1700. Behind the house, in a different style of garden, plants commonly used for medical purposes in the 15th century are grown to reflect links with the Chapel and Hospital of St Nicholas thought to have stood near the present building. Cross back over the road and begin walking down Castle Street to the statue of King William on his horse on a tall plinth. In windy weather you may see the horse’s tail moving. Castle Street runs into High Street, the main route from the Cathedral to the River Clyde in medieval times. As development continued, people came here in search of work and this area became densely overcrowded. In the late 19th century the worst of the housing was demolished and replaced by high quality, red sandstone tenements that still line part of the street today. On the gable end of one of the tenements there is a recently painted mural given the name St. Mungo. Turn west along George Street to find other murals that are features of Glasgow’s Mural Trail. As well, you can compare the more recent, utilitarian glass and concrete constructions of Strathclyde University with the grandeur of Glasgow City Chambers. The towers, turrets and stone carvings of this Venetian style building are especially ostentatious examples of the architecture in this part of town known as the Merchant City. 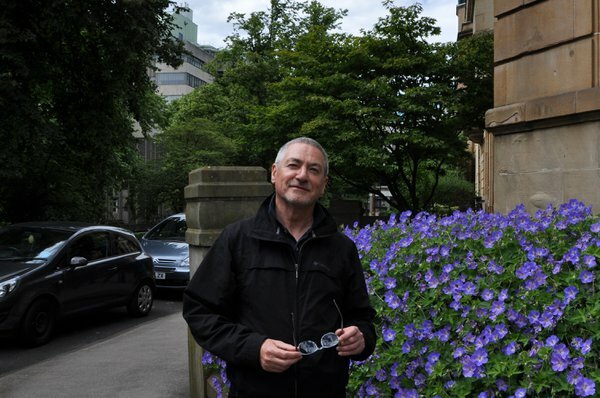 In front of the City Chambers pause at the War Memorial before finding the statues in George Square commemorating Robert Burns, Sir Walter Scott and James Watt amongst others, then walk along Cochrane Street past the other side of the City Chambers and down John Street. Hutchesons’ Hospital Hall (1802) on the left hand corner of John Street/Ingram Street was designed by David Hamilton, one of Glasgow’s greatest architects and built at a cost of £5000. James and George Hutcheson, whose statues from 1649 grace niches on the Ingram Street front of Hutchesons’ Hall were the original founders of an earlier property-The Hospital - built as a refuge for the city’s elderly craftsmen. Following a succession of different occupants the property is now a restaurant. In an upstairs hall, while the stained glass windows are lovely and the ceiling, cornice plasterwork and decoration most impressive, another feature of the building is still more arresting. The ghost of a lady (so I’ve been told) wearing a long white dress makes fairly regular appearances. She has even been seen opening the door into the hall and leaving by an unopened window. On the walls, oil paintings of Sir Thomas Lipton, philanthropic Glasgow grocer, Sir David Richmond, Provost of Glasgow in the mid1890s, and Sir William Alexander Smith, founder of The Boys’ Brigade, gaze down as if in disbelief. With the front of Hutchesons’ Hall to your left, walk along Ingram Street to Ramshorn Theatre known earlier as Ramshorn Kirk. On the nearest wall to the pavement, there is a plaque commemorating Sir John A. MacDonald 1815 – 1891. He was born hereabouts in Ramshorn Parish and went on to become Canada’s first Prime Minister. Cross Ingram Street to see the large mural on the car park wall then head down Candleriggs. Stop for a moment at the entrance to City Halls where the BBC Symphony Orchestra is based and look up to find the small plaque on the wall commemorating John MacLean, socialist pioneer. The end of this block, part of the Old Fruit Market dating back to the 1800s, is another example of Glasgow reinvention. Restaurants and bars surround a floor space used for craft fairs, exhibitions and musical events. Continue down Candleriggs to busy Trongate. An unusual feature on the opposite pavement at the Tron Theatre is an archway which was cut into the side of the building to allow the passage of carriages in bygone days. In the streets behind, there is an eclectic mix of retailers where you can be tattooed, buy a comic, an aquarium or a camera. Cross Saltmarket and turn to look back to Glasgow Cross where the Tolbooth Steeple stands marooned on an island amidst flows of traffic. Once it was part of halls and assembly rooms long since demolished that served as the 17th century municipal business hub of the city. Walk along St. Andrew’s Street. Ahead, St. Andrew’s Parish Church is a fine example of a town-planning feature that was specific to Glasgow. Built facing the end of St. Andrew’s Street, to make a grand statement, the church displays the lavish taste of Glasgow’s 18th century tobacco lords though it has recently undergone a conversion. Where once there were hymns, the space now resounds to the sound of music and dancing feet above a café/bar. The church was later surrounded by an elegant residential square. A complex of white houses that wouldn’t look out of place on a Mediterranean coast is found behind. Beyond these houses lies Glasgow Green. Traditionally the open space has been a gathering place for diverse groups including armies, trade unionists and women hanging out washings. Immediately noticeable is a tall obelisk commemorating Lord Nelson and his victories. At the eastern end is the much-loved People’s Palace (1898) part winter garden, part museum presenting social histories of the city. One exhibit depicts a once-typical tenement room. Gas lamps illuminate a small sink, a zinc bath in front of a kitchen range, box bed, and a few other bits of furniture. A taped commentary describes family life in such circumstances when bath water for the last person in line became progressively colder and dirtier. “Happy days” was overheard from a visitor who appeared old enough to know better. From the front door of the People’s Palace, take time to inspect the terracotta fountain topped with a figure of Queen Victoria above depictions of people from her Empire. Then make the short walk for a close up view of the exotic facade of the Templeton’s Carpet Factory building inspired by the Doge’s Palace in Venice. After a refreshment in the West restaurant and brewery which is housed in a corner of the building, cross the Green to wander alongside the River Clyde. 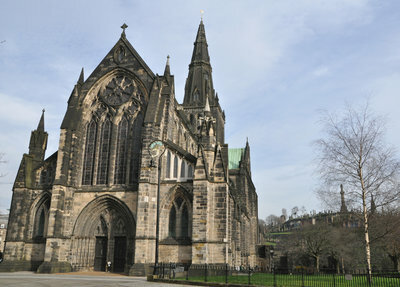 Further Information: Glasgow Cathedral doubled as the beautiful Hopital des Angles in Season 2 of the T.V. series Outlander.